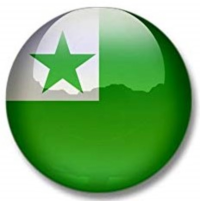 Esperanto is the most commonly used international auxiliary language, created by the L. L. Zamenhof, a Jewish-Polish oculist in the end of the 19th century. Zamenhof’s aim was to create an easy and flexible language that would serve as the universal language for everyone to promote peace and international understanding. There are three reasons why we should choose Esperanto instead of English as an international language. 1) Esperanto is one of the easiest languages in the world. Yes, easier than English. 2) Esperanto should serve as a second language, namely it should be the first learned language; the national languages sholud not be replaced. In this way, Esperanto supports the linguistic diversity of the world, not like it looks in the case of English. 3) When learning English, we are disciminated; why do we have to learn the language of another nation? English people does not learn other language so hard, does not spend money and 10 years of study on it, and poeple from other nations are still not able to speak English as well as the British, who sometimes even discourage us using English telling that our level is not appropriate. Unfortunately, his goal has not been achieved, but not because it is not a good idea, but because of politics. No one pays for teaching Esperanto, and countries that have the main political power in the world do not want Esperanto to be an international language. Today, Esperanto is used by about 2 million people around the world. There are books originally written in Esperanto and also Esperanto translations of the world’s most important works. There are Esperanto concerts, bands, festivals, congresses, conferences and even tourist trips, whose main language is Esperanto . Our school specializes in this language too. My Esperanto knowledge, my Esperanto master diploma and my language exam guarantee the professional quality of our translations.